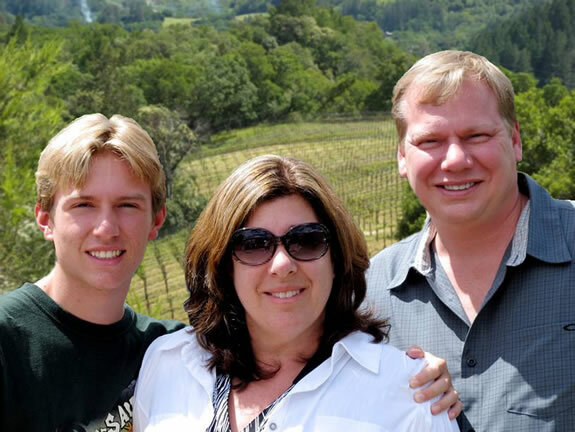 Match Vineyards is a small, family-owned winery making Cabernet Sauvignon from our own two hillside vineyards in the Napa Valley. Our wines possess a lovely elegance and finesse that places them among the best that the Napa Valley has to offer. It’s hard to believe that it has been over 12 years since the first harvest at our Butterdragon Hill vineyard. Since that time, we have received an incredible amount of support and enthusiasm from you, our friends old and new, as we added the Baconbrook vineyard and grew in size and reputation. Match Vineyards started with a few goals. I wanted to produce world class, single vineyard Cabernet Sauvignon wines – wines every bit as good (or better) than many that had been anointed with cult status by the press and public. Our wines were to be the purest expression of the unique time and place where the grapes were grown. They were to be reasonably priced, spurning the use of “hostage” mailing lists, minimum purchases, or maximum allocations. The business would also ultimately need to operate in the black. I have succeeded in all of my goals except the last. I am confident to say that Match Vineyards’ wines are delicious and sophisticated, offering perhaps the best value in single vineyard, Napa Valley Cabernet Sauvignon available today. Critics and customers have agreed. This simple note cannot adequately express my gratitude to you who have been loyal, even passionate, customers, buying our wines year in and year out. It has been my pleasure and honor to be part of your family’s celebration tables. I have been lucky to work with a great team led by winemaker Cary Gott and vineyard managers Jim Barbour and the Piña Family. I would be remiss without mentioning my wife Sasha Match and our son Alec Speckenbach. Whether it was a task as simple as stuffing envelopes or as critical as financial sacrifice, their support has made Match Vineyards possible. They have lent more than their names in the pursuit of my dream. As some of you already know, we have, at least temporarily, ceased bottling new vintages. We continue to grow fantastic grapes at our Baconbrook vineyard on Spring Mountain. For the time being, they are being sold to other premium wineries. We also have past vintage wines that we still need to sell. The last wines we made were in 2010 vintage but with just a few exceptions, we also have wines from both Butterdragon Hill and Baconbrook vineyards dating back to our earliest vintages. I am offering them to you at wholesale price (1/3 off retail). I hope to make it possible for our valued customers to restock their cellars. I also hope some new customers might give our wines a try at this lower price. My promise to them is they won’t be sorry. Thank you for what has been a fantastic 12 years together in the world of wine.